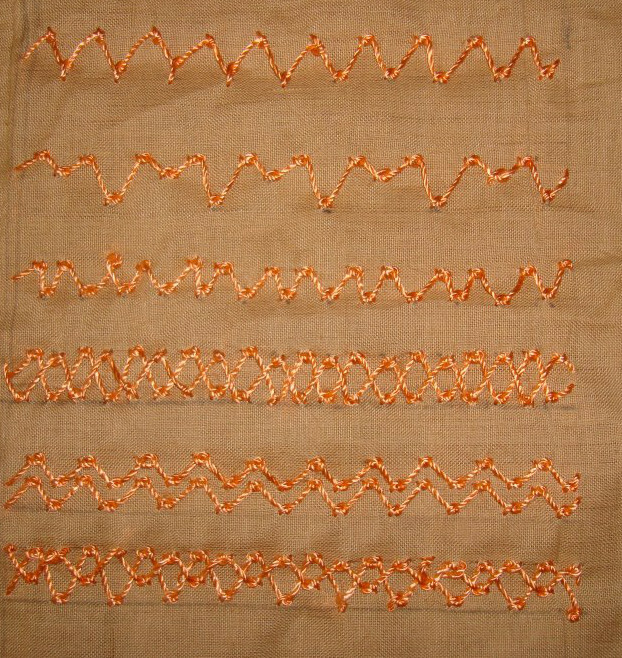 Some exercises of building a seam with zigzag coral stitch and other TAST stitches. Seam 4- other stitches are feather stitch and detached twisted chain stitches. Not as impressive as I thought it would be. Seam-5- scalloped stem stitch with fly stitches. Seam6- The lines were crossed and rice stitch worked on them with detached chain and quarter buttonhole wheels. Actually, this seam looked far more interesting without detached chain and buttonhole wheels. Seam 7- berry stitches and french knots. The berry stitches worked at an angle looks better. Seam 8- this seam did not turnout the way I wanted at all. Thought this stitch worked like this would look more impressive. Other stitches are- cretan stitch, arrowhead and rope stitch. 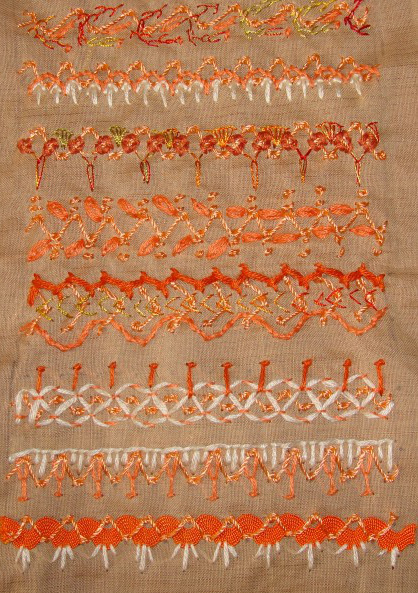 Seam 9- a simple seam- with laced running stitch around the coral stitches with pistil stitches. Seam 10- buttonhole variation and Italian border stitches. Seam 11- Ricrac attached with zigzag coral stitch with straight stitches. This stitch ideal for doing this. With this seam this sampler was completed. I need to practice more on building seams, hope the TAST stitches are easy and quick to work with as this stitch. Coral stitch is combined with this zigzag version in the first two samples. I want to learn the process of building seams for embroidery work. These are the attempts made with this stitch as the base. Detail of the first seam, with herringbone stitch, french knots were worked later. Looped cretan stitches are worked over the coral stitches, fly stitches were added later. These two samples have straight stitches and detached chain stitches. 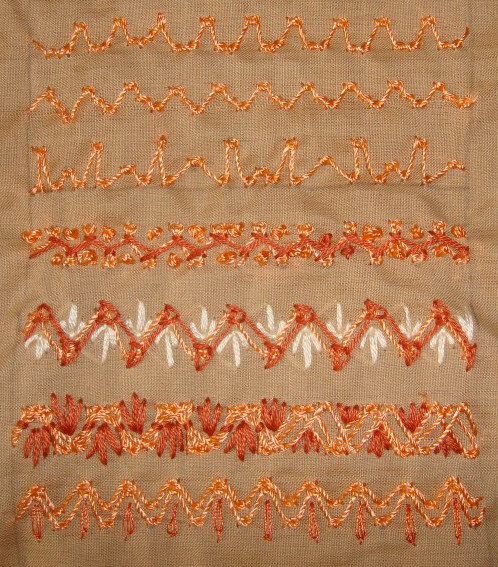 The zigzag coral stitch variation for the above sample. Later I tied the first few stitches as sheaf stitches, then left the rest for reference. Two rows of zigzag coral stitch variation for the second sample. I started working this stitch sampler. The working of this TAST stitch is on SharonB’s blog. We had done coral stitch and wrapped coral stitch before on this challenge. The working of these stitches are also on her blog. This stitch closely resembles the rope stitch we did last week. I started with some zigzag variations and moved on to working versions of two rows of this stitch. I’ll start on some stitch combinations and build some seams along with that on this sampler.